We had some words prepped, but they’re stuck in the other B&C hard drive, which is being held hostage by the Windows 8.1 “We couldn’t complete the updates / Undoing changes / Don’t turn off your computer” circle of Hell [110 minutes and counting; we doltishly didn’t send ourselves a backup file]. So we sought alternate routes for this Tearing-Our-Hair-Out Thursday grab bag…including some this-just-in breaking news! Spirits suddenly soaring at the B&C desk! • On April 7, we reported that Grey Sail’s 3rd Anniversary, an Imperial India Pale Lager that was brewed to commemorate their third birthday, was a huge hit and would become a limited year-round offering, with a name and release date TBA. We’re pleased to announce that the brew will be called Great Ketch Imperial IPL [8% ABV]. It’s an outstanding take on the hybrid style, which combines the smoothness of the lagering process with the waves of flavor from Amarillo, Simcoe, Citra, Galaxy, and Mosaic hops. Great Ketch will be in four-packs of 12-ounce cans and on draft, and fingers are crossed for a June release. 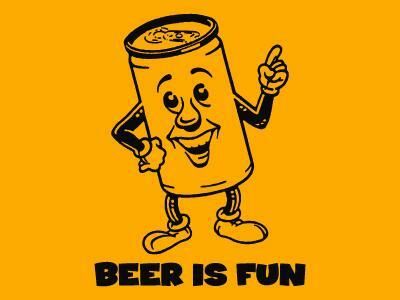 And be on the lookout for the new six-packs of Pour Judgement IPA! Grey Sail is cranking 24/7! • In preparation for the Dogfish Head Tap Takeover that starts at Norey’s on Friday, all draft beers are half-price tonight [4.30] only from 4 pm until 1 am. • Brutopia kicks off its One Year Anniversary bash on Saturday [5.2]. Go here for details on the eight-day extravaganza, including a pig roast on Sunday and a Masters Brewers Meeting and Tasting, with guest beers and specials for Mug Club members, on May 8. Aprihop • 60 Minute IPA • Sixty One Minute IPA • 90 Minute IPA • 120 Minute IPA • Burton Baton • Palo Santo Maron • Indian Brown Ale • Namaste • Piercing Pils • Black & Blue • Noble Rot • Midas Touch • Birra Etrusca Bronze • Chateau Jiahu • Kvasir • Rosabi • Olde School Barley Wine • Raison D’Extra • AND Randall the Enamel Animal, an “organoleptic hop transducer module” [aka a double-chambered device that infuses multi-flavored enhancements as the beer is delivered to your glass] will be the 20th!! The beers will start flowing at 4 pm [Norey’s is open Monday through Saturday from 4 pm to 1 am] and will be pouring until the kegs kick [some will likely still be in action on May 8 and 9 during the Newport Craft Beer Festival sessions]. 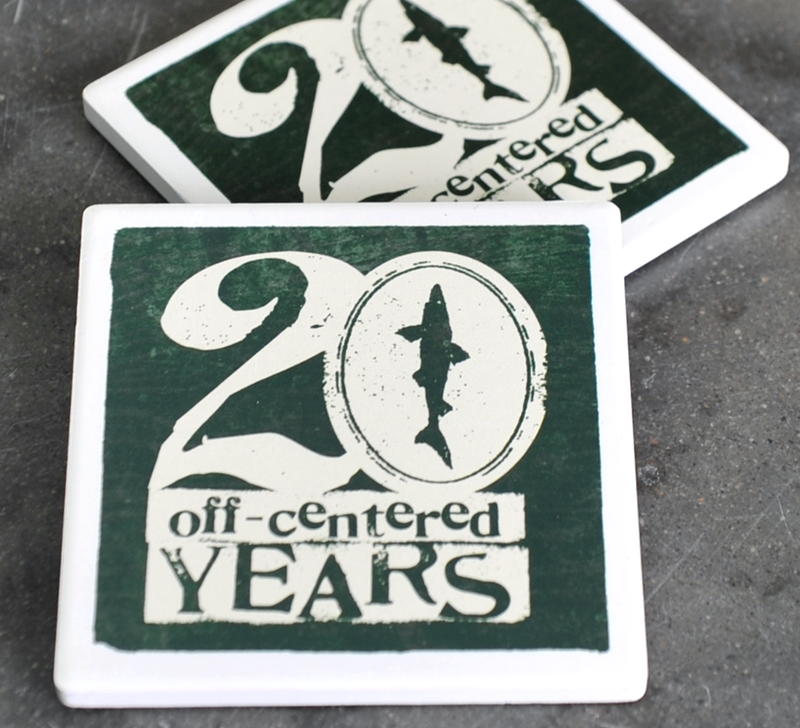 Cheers to Sam Calagione’s 20 years of innovative beers! 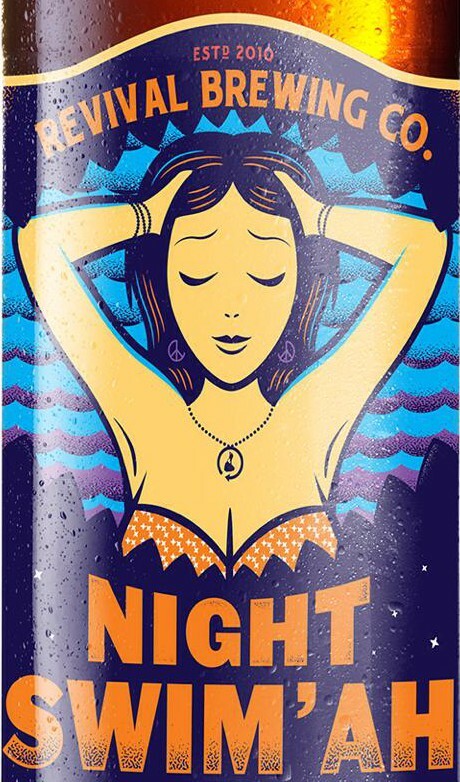 • Revival Brewing Co.’s newest creation, Night Swim’ah, is making its way to better beer bars all over the state. The Belgian-style wheat ale is a light delight and will be a perfect sum’ah sipper. And down the road apiece, Revival hopes to have four-packs of White Electric Coffee Stout in stores by Memorial Day. The B&C desk has posted hundreds of thousands of words in the last six months, but today we’re going light on the prose and heavy on the pictures/links. Hey Dave, get those tanks going ASAP! On Wednesday, inspired by the arrival of Jack’s Abby and New Belgium announcing that it will be adding PA as the 39th state in its distribution network, we asked, “What brewery would you most like to see in the RI market?” There were nine choices — primarily long shots but feasible someday-maybe candidates [there was also a slot for write-ins]. 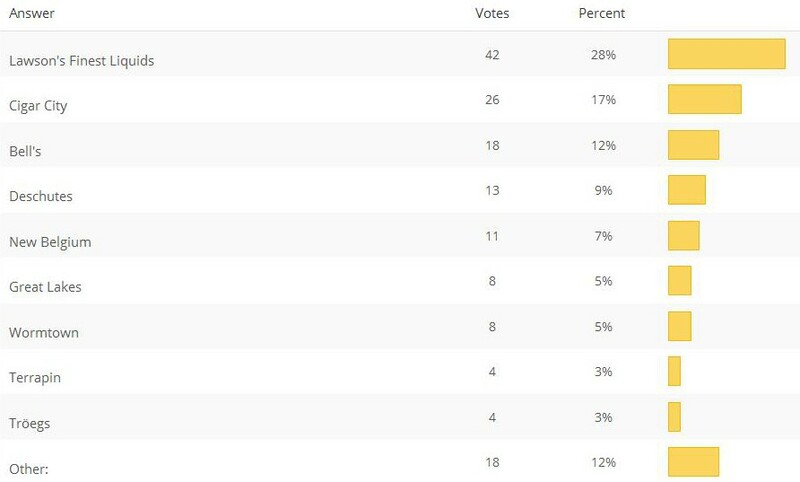 We received 152 votes: The “Other”s are mostly in the “it doesn’t hurt to dream” category: Hill Farmstead, 3 Floyds, Trillium [3 votes]; the Alchemist, Bissell Brothers, Surly [2 votes]; Adirondack, Great Divide, New Glarus, Pipeworks, “Support for RI breweries” [1 vote]. 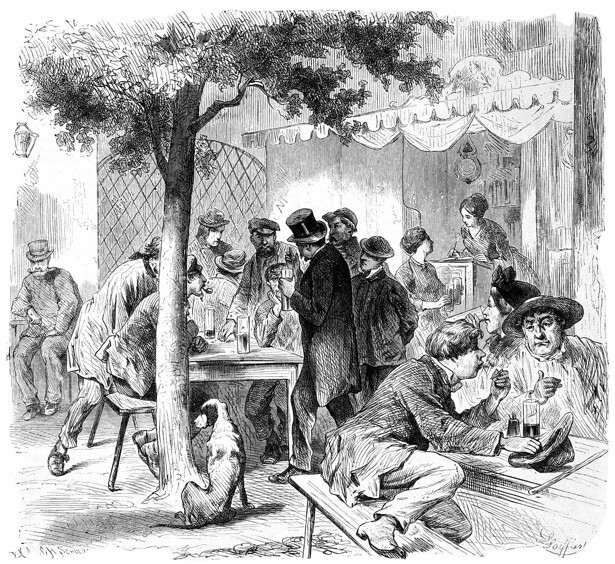 Craft beer’s future, plus a closer look at the top brews; the history of the beer garden; and more! Beer fun: the Great International Beer Fest, the ‘Rhode Island Beer’ book tour, Whaler’s at the Grange, Jack’s Abby tap takeovers, and more! • Jack’s Abby roared into RI this week, and there are two more tap takeovers on the introductory slate: tonight [4.24] at Track 84 [aka the winner of the Favorite Rhode Island Beer Bar Bracket; 7 pm-close] and on Saturday at English Cellar Alehouse [5-10 pm]. Say hi to co-owner Sam Hendler and enjoy their world-class lagers, including the new, ultra-limited, quintuple-hopped Excess IPL. 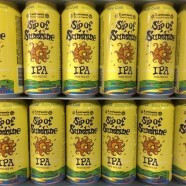 • The 9th Great International Spring Beer Festival is on Saturday [4.25] at the Rhode Island Convention Center, with unlimited sampling of more than 250 different beverages [and free slices from Pizza Pie-er]. There’s a lot of macro in the mix [and not much internationality], but discriminating drinkers should find plenty to sip and savor. We suggest spending lots of time with the bolded locals: 21st Amendment, Bad Martha, Berkshire Brewing, Blue Moon, Bucket Brewery, Coors, Guinness, Finch’s, Foolproof, Goose Island, Grey Sail, Harpoon, Heineken, Magic Hat, Narragansett, Newport Storm, Opa-Opa, Paper City, Radeberger, Ravenous, Revival, Samuel Adams, Shipyard, Sierra Nevada, Stark, Traveler, Trinity Brewhouse, Two Roads, Union Station, Victory, Woodstock Inn, and Yuengling [plus Angry Orchard, Downeast, and Twisted Tea]. Sessions run from 1 to 4:30 pm [with music by the Rock] and 6:30 to 10 pm [the Network]; tix are $52 at the door. • On Saturday, you have two opportunities to meet ’n’ greet Ashleigh Bennett and Kristie Martin, the esteemed authors of Rhode Island Beer: Ocean State History On Tap — and sample Innsmouth Olde Ale, the second entry in Narragansett/Revival’s H.P. Lovecraft Series. They’ll be at Barrington Books from 1-2:30 pm and Symposium Books in downtown Providence from 5-7. • On Sunday [4.26], The Grange will host Whaler’s Brewing Company’s first-ever beer dinner. Click here to see the menu for the three-course bash [6-8 pm, $40pp], which will be followed by a set of standup and storytelling by Vito Lantz around 9. And huzzah to Whaler’s, which was cited as Best No-Frills Brewery in Yankee Magazine’s Best of New England issue. • Two no-go destinations: the Bucket Brewery will be closed on Saturday, but you can visit them at the Convention Center; and Proclamation is closed all weekend, as they prep their HQ for the arrival of the shiny new brewing tanks. • And you can still let us know “What brewery would you most like to see in the RI market?” The poll will be open till Sunday. Throwback Thursday: Hail to the Schemers! Every now and then we play along on Throwback Thursday [#TBT]. Today, we’re throwing back with the extraordinary roster of musicmakers and industry pros who will be honored on Sunday [4.26] at the 2015 Rhode Island Music Hall of Fame Induction Ceremony. The fourth annual class features the Schemers/Raindogs/Mark Cutler, Brenda Bennett, the Others [congrats to our ol’ pal Bob Angell — good on ya! ], the Ascots, and Marty Ballou and Marty Richards [who will all perform at the event], plus Nelson Eddy, George Wein, Paco Zimmer, and Georgie Porgie & the Cry Babies; Duke Belaire, George Masso, and Bob Petteruti were honored at the Hall’s jazz bash, which took place at Bovi’s on Monday. In the last three years, the late, lamented Providence Phoenix ran cover stories to celebrate the inductees, bursting with bios, notable quotes, and fun facts [here’s a link to the 2013 edition]. We were hoping that another publication would follow our lead and continue the tradition…but, alas, no. You can read about the Class of 2015 at the RIMHOF website. And you can revel in the glorious history and local pride when the inductee exhibits will be unveiled at the RIMHOF Museum [999 Main St, Pawtucket] at 2 pm; the speeches and performances begin at 3:30 at the Met [$20 advance, $25 door; no charge to attend the exhibit ceremony]. To paraphrase 2013 inductee George M. Cohan, it’s gonna be a grand old time. 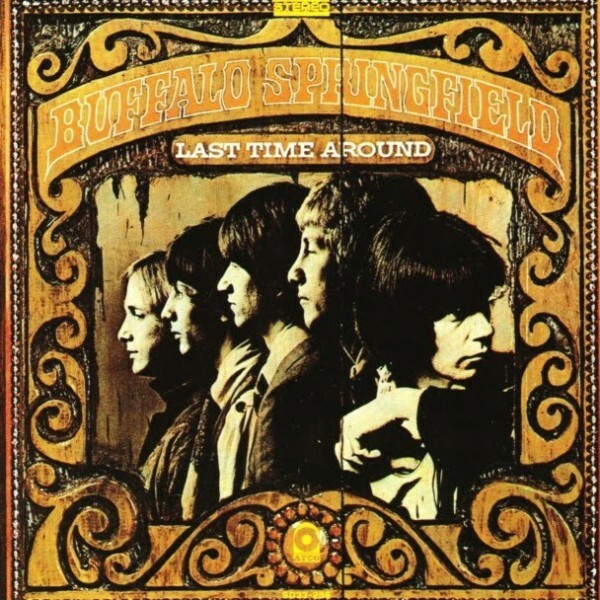 Thanks to Mark, Emerson, Jimmy, Dickie, and all the other Schemers [Ed, Mark, Pete, Rick, Rene, Matt, and Bob] and Raindogs [and Dino Clubbers and Men of Great Courage and Tiny String Banders] for decades of pleasure [aka some fun]. And they ain’t done yet: the Schemers still play a few times a year — and are working on a new album! Long may you run, gentlemen! We salute you! It’s June 28, 1984. Twenty minutes ago, the Schemers won the WBCN Rock ’n’ Rumble — the first not-from-Boston band to capture a very prestigious prize in a potentially career-changing battle of the bands. They played two exhilarating sets [and I’m not just working from hazy memory here; the tape of the absolutely incendiary second set is surging through my headphones as I type]. I walked out of the club, dazed, thrilled, and delirious. I found the backstage door and talked my way into the celebratory fray. And this is the moment, the defining moment of the night, what I still tell people about 20 years later: Finding Mark Cutler quietly huddled in a corner with the singer from Dub 7, the band the Schemers had bested. He was commiserating, bonding, finding common ground. Amidst the cork-popping and high-fiving, Mark was embodying the qualities found in the best Schemers songs: empathy, warmth, sincerity. The other qualities — exemplary songwriting and ace musicianship — had put them in the winner’s circle. It’s November 6, 2003. I’m typing, they’re staring. Let me explain: I have a four-foot-wide-by-six-foot-high reproduction of a 1987 NewPaper cover leaning against the wall to the left of my desk. 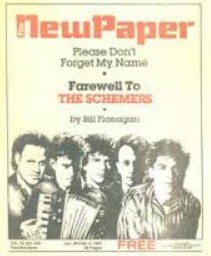 It’s the cover with Bill Flanagan’s definitive Schemers story, written to commemorate their glorious run and then-painful breakup: “Please don’t forget my name: Farewell to the Schemers.” The image appeared on the cover of the issue celebrating the 25th anniversary of the NewPaper and the Providence Phoenix, and was one of a dozen that were displayed at the birthday bash — which was headlined by the Schemers. The fans of the band — the fans who saw them in the earliest days when Ed Tabela was the lead singer and there were six members; the fans who saw Mark and Emerson and Jimmy and Rene grow up in public at still-legendary clubs and joints whose names are long forgotten; the fans who saw them open for X at the Living Room in 1982, perhaps the most hot-wired night of music ever heard in Providence; the fans who showed up week after week at club after club in 1985 and ’86 when the band was at its absolute peak; the fans who mourned the band’s dissolution in 1987, but ultimately realized that they had pushed and climbed and stretched and reached their limit — who knew the Schemers as surely as the Schemers knew them. It was a perfectly symbiotic relationship. But [suddenly] it’s 16 years later, with them staring and me typing. After their set at the 25th bash, Mark asked me to write some notes for this package. A few days later, the giant cover found its way into my room. It’s been a time of reflection and contemplation — so many stories, so many memories. And the Mount Rushmore-like image of the Schemers has provided a wonderful reminder of how many of those stories and memories have been played out with the Schemers as the soundtrack. All right, it’s getting misty in here. I realize I haven’t “backed up” my moment of truth re: the Schemers being the best band the state has ever known. But these are my notes, and it’s my truth. Other Rhode Island bands have had greater commercial success, and a slew of others have had a longer shelf life. No matter. 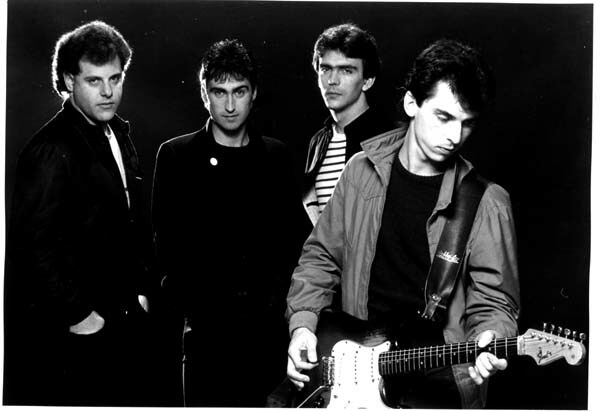 I have spent more time with the Schemers than with any other band. It has been time very well spent. They are as vital now as they were 20 years ago. That’s because empathy, warmth, sincerity, exemplary songwriting, and ace musicianship are timeless.